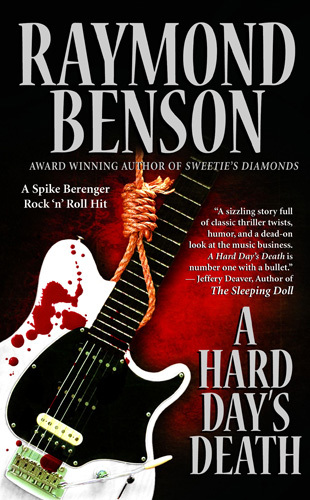 Raymond Benson’s most recent novel A Hard Day’s Death (the first of a series) is now shipping from Amazon. If you happen to live in the Chicago, Illinois area and you want a signed copy, you should make your way to Barnes & Noble in Lincolnshire (920 N. Milwaukee Ave.) at Noon on April 5th. On April 6th, Benson will be at Centuries & Sleuths in Forest Park (7419 W. Madison St.). Benson is already hard at work on a sequel, currently titled The Dark Side of the Morgue and his next novel, an adaptation of Metal Gear Solid is due out on May 27th. On the 11th and 12th of April Benson will be attending a James Bond weekend in Lake Garda, Italy and will be in London for a book signing on the 15th. A little over a year ago, I actually almost moved to Lincolnshire. Whattya gonna do.